Matt Peiken, former arts reporter for the St. Paul Pioneer Press, former managing editor of Walker magazine at the Walker Art Center, is now producing mini-videos called 3-Minute Eggs about the Twin Cities arts scene (as he says, "the Twin Cities arts seen"). The ones I've watched have been terrific--beautifully produced, informative, intriguing, just long enough to make you feel you've learned something and whet your appetite for more. Recently Peiken made an Egg on the Dakota Combo's performance at MacPhail Center for Music. There doesn't seem to be a direct link to it, but if you go to Peiken's website and scroll down to 28 May 09 you'll find it. 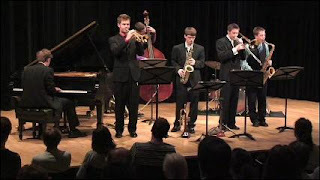 The Dakota Combo is an elite group of area high school musicians, chosen annually by audition, who have spent the past year learning and rehearsing with MacPhail jazz coordinator Kelly Rossum. Now that Adam Linz has been named to lead the jazz program at MacPhail, he'll take over Combo duties. Hat tip to Tom Trow, who saw David Brauer's piece on MinnPost, which I somehow missed. You can also watch the Egg on MinnPost. Twin Cities Public Television is now airing Eggs. That's great news, except TPT isn't paying Peiken. Can't they pay him something? Really? Image from Matt Peiken's video. The sad truth: why should they, if he's willing to give it for free?